A rising cycling star from Penrith received £2,000 from the Cumbria Young People’s Fund to help towards competing in national and international events over the summer 2016 season. 17 year old Mark Donovan won the UK national cyclocross title in 2016 and came second in the six race national cyclocross series. Mark also achieved great results internationally last year. He won the blue sprints jersey in the junior tour of the Basque Country, and the pink sprints jersey in the junior tour of Pamplona. Mark has already had some major wins for 2017, as well as studying for his A Levels. 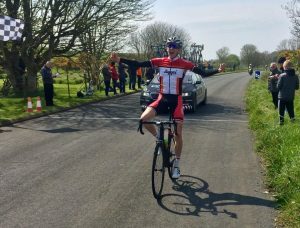 He recently rode to stage three victory at the Sleepwell Hotels Isle of Man Junior Tour, beating Great Britain’s number one junior rider, Tom Pidcock. He also won the first contest of the Spanish national junior race series in February. This summer, Mark has stage races in Holland, Belgium, France, Spain and Italy. Once he completes his A Levels, Mark hopes to pursue his aim of becoming a professional cyclist. He would like to join a cycle race team abroad for a year.